Happy New Year’s Eve! 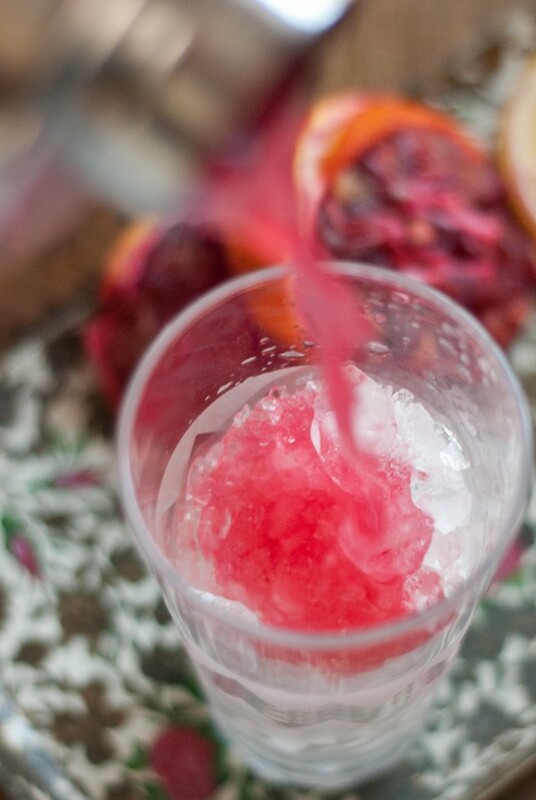 I’m posting this fizzy pink cocktail far too late for you to make it tonight, I know. Please accept my apologies. Resolution No. 1: Start planning ahead. I can’t say I’m sad for the year to end because I’m busy looking forward to the year ahead. 2011 has been a year of growth. I learned how to get unstuck, if you will, by leaving an unfulfilling three-year-long relationship and quitting a miserable office job. I traveled as much as possible in search of a new city to call home. I cultivated friendships and tried to savor every moment in each season. I learned a lot of lessons in my 25th year—some invaluable and others, trivial. I started referring to myself as a woman rather than a girl. That’s something. I realized I’d rather snuggle with my dog than a jerk. I developed a serious appreciation for stretchy pants. Each little success on this blog has reinforced my belief that persistence and creative development will help me get to a better position in life, whatever that may be. I’m eager to discover what’s in store for 2012. My main goal is to get out of this town and make a new home elsewhere (Kansas City, here I come!). I also resolve to exercise and floss my teeth and wear sunscreen daily. See? I’m old. 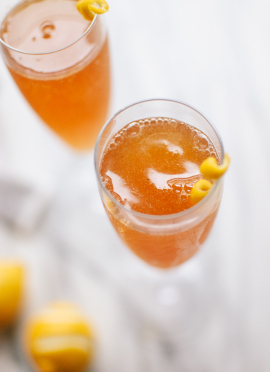 Celebrate with a sparkling, pink French 75 made with blood oranges, gin and Champagne. Fill a small cocktail shaker with ice. Pour in the gin and the blood orange and lemon juice. Shake well. Taste and add agave nectar or simple syrup if necessary, to taste. Strain the gin mixture into the glass. Top with Champagne. Garnish with a blood orange twist (you’ll see in the pictures that I played around with garnishes but the twist is more traditional). 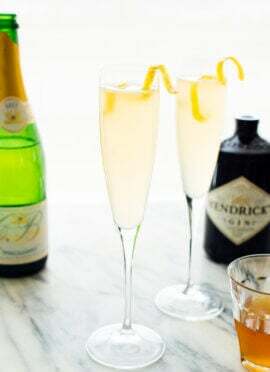 Adapted from Imbibe Magazine’s French 75 Recipe. One last thing! 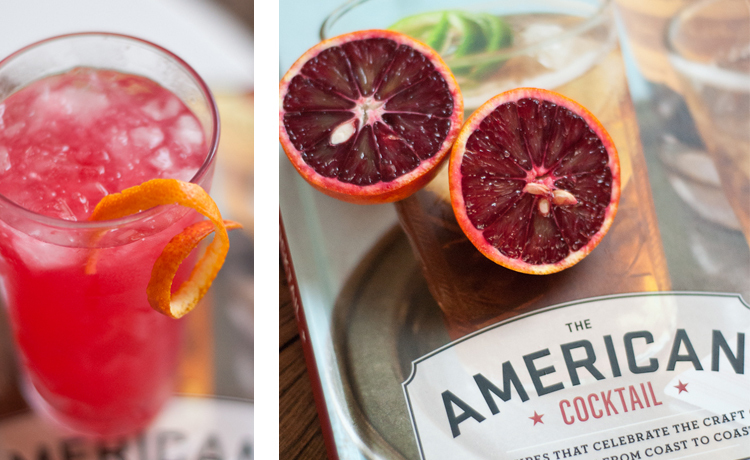 I am giving away a copy of The American Cocktail, by the editors of Imbibe Magazine, to one lucky reader! It’s a beautiful little book filled with 50 inventive cocktail recipes, which are organized by region and accompanied by Sheri Giblin’s inspiring photographs. Ms. Giblin puts my work to shame. For a chance to win, leave a comment below! Tell me about your resolutions, your New Year’s Eve festivities or why you’d like to win the book. Anything will do. The fine print: You have until midnight CST on Thursday, January 5th, to leave your comment for a chance to win. I will notify the winner by email on Friday; the winner must reply within 7 days with a valid mailing address or I will randomly select another winner. Good luck, and Happy New Year to all! Update: Congratulations to Shelley for winning the giveaway! Thank you to all who entered—I loved reading every single comment! 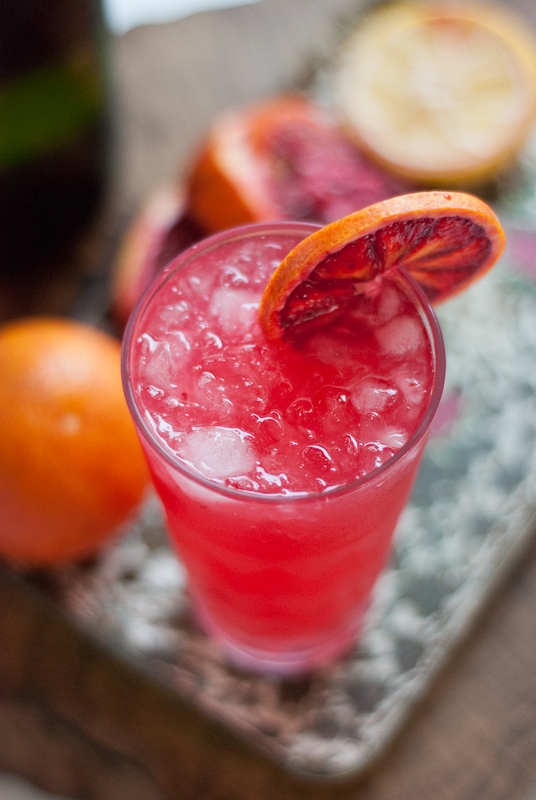 The blood orange cocktail looks beautiful. I wish I had it the ingredients on hand to try it out this new years eve! Thanks for the post. My New Years resolution is to enjoy each day and eat healthy! And unfortunately, I’m stuck at home with strep this New Year’s Eve, watching Say Yes to the Dress on Netflix instantwatch and slurping down jello…certainly not the best way to end 2011. But hey, it means that 2012 will be off to a great start, right? Apps are assembled, Champagne is chilling and I’m drinking water so my champagne has something to land on. Happy New Year! Happy New Year! May it bring you joy, love, and strong health! I am having a very low-key celebration with my family – following a delicious family dinner, we will be making appetizers to have later with a glass of celebratory champagne! my goals for the new year are to be positive, grateful, + maybe break a few bad habits i’ve picked up along the years. we’ll see! My new years resolution is to experiment with different foods, recipes and DYI projects instead of buying! Happy New Year!!!!!! My goals for the year 2012 include fulfilling a list of 35 things to accomplish within my 35th year which begins on January 3. Some of these include: Pay a waiter/waitress $15 above average for a tip, buy 2 strangers a cup of coffee, send 6 postcards/ letters to 6 friends, visit 10 wineries (complete with tastings!) – although this may be hard to do in the northeast! Headed to the kitchen to bake up your spicy molasses cookies now! I have themed 2012 the year of being gentle with myself. This means a healthy balance of exercise, adventure, sewing projects, quiet evenings with my dog, dinners with friends, great cooking and much more that’s still unknown. Kicking off the year with running my first marathon, buying a home (I hope! ), and this cocktail! Thanks! Congrats on your 2012 resolutions and 2011 lessons learned. I hate when life throws lemons, but if it weren’t for lessons learned we would never appreciate anything. Am I right? My favorite New Year’s cocktail is a good old fashioned White Russian. Mmmmm I love those! This is BEAUTIFUL any blood red oranges are my fav. I wish you a happy new year and hope this year brings you a lot more success and yummy food and drinks. KANSAS CITY!!!!! Happy New Year, lady! I love this cocktail. My plans for 2012 include relaxing more, keeping my eyebrows plucked, and finishing a half marathon in less than 2 hours. My husband and I enjoy visiting New York City during the day time on New Year’s Eve. Walking around SOHO and the Village seems surreal because it is less crowded…feels like you are on a movie set. My new years resolution is to talk less and listen more. Love your blog and this give-away! Hope I win, wish me luck! I hope your 2012 is fantastic and full of fulfillment! I enjoy your blog and your honest thoughts. My New Year’s resolution is to have more adventures, read more, keep a sentence a day journal and grow deeper in my faith. Keep up the good work! and all the best in Kansas City! Happy New Year! Your move sounds so exciting! I think I heard James Oseland of Saveur say that Kansas City is where it’s at food-wise for 2012 (on Today show). Sounds like we had a fairly similar 2011! I am also hoping for a better year in 2012…good luck with yours! Yay! Love end of the year reflections! I am so happy for you and excited about all your adventures to come :) Glad I got to visit your Norman spot one more time before you pack up for KC. Aaaand i can’t wait to visit your new digs and for you to check out Mpls! This all fits in nicely to my new years resolution (recycled from last year): Spend more time with friends! This time last year i was still very new to Mpls and just began a serious relationship, so I thought I better give extra conscious attention to investing quality time in my new and long time friendships. I didn’t really do as well as I would have liked, so that is why i am reasserting this resolution for 2012! Yay! My goals for this year are to lose weight. go to the doctor and do all those necessary tests, and have fun. I’d also like to branch out cocktail wise, so this book would be great. I love your blog! All of the great recipes and delish drinks ! New Years resolution: Have more fun. Life is ticking by….so fast. I’m going to start enjoying each moment, laughing more, instead of worrying about what needs to be done next. What a generous gift. Thank you so much for thinking of all of us. I hope your New Year is filled with joy, and happiness. My New Years Resolution is to live in the present. Move to Kansas City!!!!! I left Des Moines, IA in 1984 for Washington, DC then Boca Raton, FL returning to DSM 22 years later to spend time with my dad. Your life will expand so much you have no idea. Go for it. Write down all your excuses and then cross each off realizing that excuses won’t get you any where. Good Luck. I’m resolute to be more aware! In living my life, loving my family & how I treat my friends. I think that is the best way to live in the moment for 2012. I have (unofficially) resolved to make more delicious cocktails in 2012. My resolutions are to be happy, and say yes to adventure more. No more excuses about time/money!! Congrats on becoming unstuck. May 2012 be even more awesome than you could imagine! I’d like to give this book as a gift. What a great giveaway! This year I’m looking forward to building traffic on my blog and getting into better shape! Love this drink; it looks delicious! Looks great! Interesting that you have committed to move. My plan for this year is to have an exit strategy from Vancouver by next New Year’s Eve. It all might move much more quickly than that, but at least having a clear plan will be a great step for me. Happy 2012! And I’m crossing my fingers for the giveaway! my husband is WAY into cocktails right now–i would love to win this for him! Happy New Year! 2011 was a year of growth for me as well. Getting unstuck and learning what you don’t want are just as important as finding out what you do want. Also, stretchy pants and I have become best buds. I don’t really make “resolutions” but more like goals… this year I want to do more for others, as well as establish myself in my new home in Boston! you’re great. i love these reflections, and so happy for you on the big move! i must have missed that somewhere along the way. Cheers to 2012, I do agree, I think it will be much more fulfilling than 2011 :) Here’s to you, friend. You had me at blood orange!! Cook more random meals in 2012! One thing I have learned from your posts… it seems I am missing a LOT by not drinking hard alcohol! All of the drinks have been looking amazing. I get stuck on drinking red wine, because it always seems like a safer bet… but I am slowly changing my ways about that. Had the all too rare cocktail made from scotch on New Year’s and it was SO good! I guess that will be my answer to one of your questions… I would like the book, so I can expand my tastes and start experimenting with and enjoying more cocktails! My resolution is to enjoy Life as the most precious gift I received and which I am not allowed to waste. So I keep respecting myself and others and i throw away regrets and wrong choices. Life is Beautiful! Vita è Bella! So pretty! 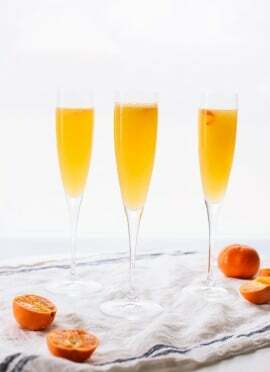 I have a leftover bottle of champagne but can’t find blood oranges in my area! Weird since I live in boston! Last year I subscribed to all these great blogs and salivated over the recipes and pics- this year I need to start making the recipes I tuck away instead of just looking at them! I’ve discovered stretchy pants also! They are awesome, except they have a snap button on them that keeps popping when I bend over… Oh well. Savoring every moment is something I am resolved to do this year. There comes a time in your life when you realize the time is now. You’re awesome! Have a great new year! Great! I’m going to try that!